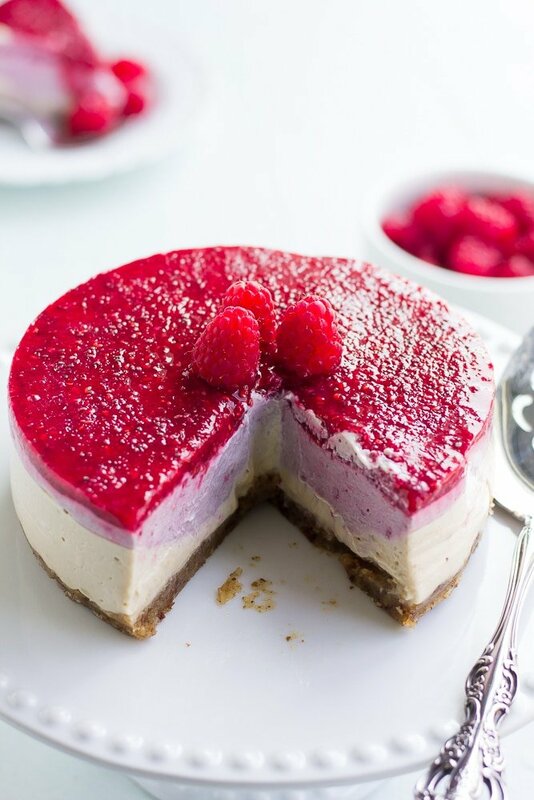 This No-Bake Raspberry Layered Vegan Cheesecake is beautiful and easy to make! 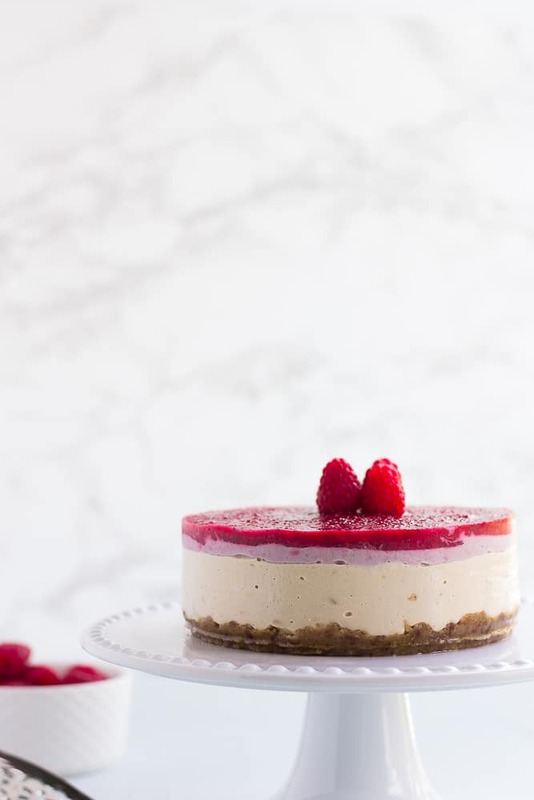 The cheesecake layers are creamy and luxurious thanks to cashews, with a tart raspberry topping. 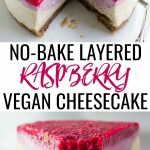 I had so much fun making this raspberry layered vegan cheesecake! Seriously, no-bake vegan cheesecakes are my new thing. I’m planning on making a pumpkin one for Fall, and a chocolate one may be in the works as well…. The possibilities are endless! Last week, my family and I headed to the Farmer’s market, where there is live music every Tuesday evening. It’s such a blast, and we try to go every week all Summer long. I got a 1/2 flat filled with blueberries, strawberries and raspberries and we just munched on those while listening to the music. My kids were so happy! Ah, summertime. 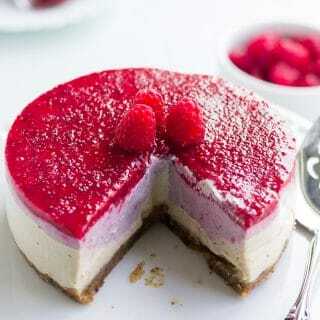 We had so many raspberries left, that’s when I decided to make this cheesecake. And I’m so glad to be sharing it with you now. 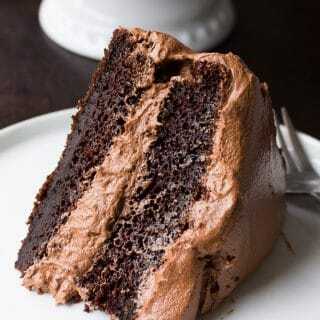 Don’t let the layers scare you, it’s actually really easy to make! What kind of pan do I need for this vegan cheesecake? 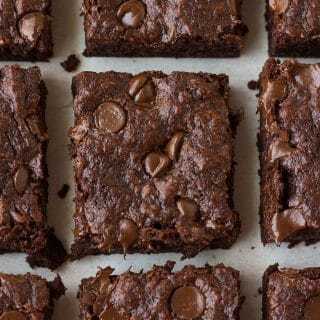 This recipe will be the best and prettiest if you have a 6 inch Springform pan. I only had a larger one on hand, but since this cheesecake is so rich, I didn’t want to make a huge one. So I did invest in the 6 inch pan, and I’m glad I did. You could also use a 6 inch cake pan, but if you do just make sure you grease it well (I like coconut oil for this) and/or line it with parchment paper strips to make it easier to remove the cheesecake. 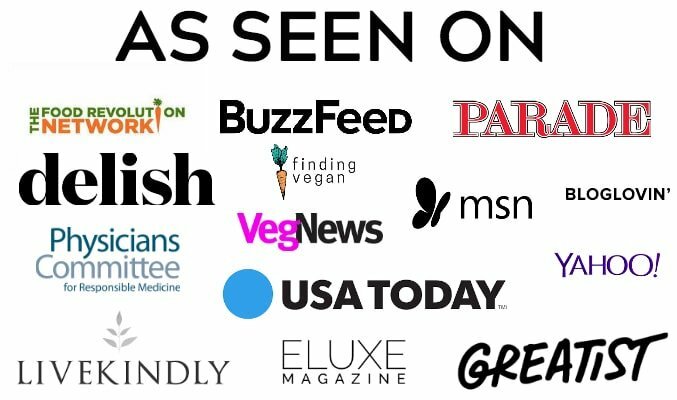 But really, if you see a lot of vegan cheesecakes in your future (like I do) it’s a pretty inexpensive pan to get. 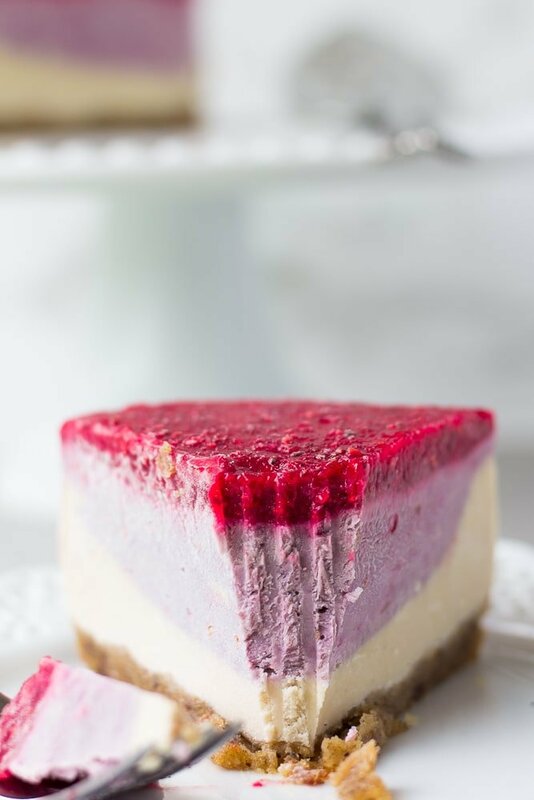 You won’t believe how luxuriously creamy the layers of this vegan cheesecake are! Cashews for the win. Make sure to soak those babies well so they will blend up smooth (see Note below). Grease a 6 inch springform pan with coconut oil, or line a 6 inch cake pan with parchment paper for easy removal. I would recommend greasing it as well. Make the crust: To a food processor, add the walnuts, almond flour, dates, 2 tablespoons water and salt. Process until a sticky dough is formed, adding another tablespoon of water (or more) if needed. Do not over process. Press the dough evenly along the bottom of the prepared pan. Make the first layer: To a high powered blender, add the soaked cashews, coconut milk, agave or maple syrup, lemon juice and vanilla. Blend for about 2 minutes, stopping the scrape the sides of the blender as needed. Blend until very smooth and creamy. Pour 2/3 of the filling on top of the crust in the pan. 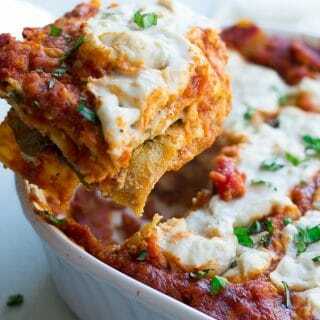 Place in the freezer while you make the next layer. Make the second layer: Add the 1/2 cup raspberries to the remaining mixture in the blender, and blend until incorporated. Pour this on top of the first white layer, and return it to the freezer. Make the third layer: Quickly rinse out the blender, and add the 1 cup raspberries, lemon juice, agave/maple and chia seeds (the tart raspberry top layer ingredients). Blend until smooth, and pour over the other layers. Return to the freezer, and let set for at least 3 hours (overnight preferred). To serve, gently remove from pan and run a large heavy knife under hot water for a minute before cutting the cheesecake with the warm, dry knife. You can also let it thaw to room temperature for 10-15 minutes to make it easier to cut. Store leftovers in the fridge for a couple of weeks, but make sure to wrap it well to avoid freezer burn. Top with more fresh raspberries, if desired. To soak raw cashews, boil a few cups of water (I use my tea kettle) and then pour it over the cashews. Let soak for 5 minutes to an hour to soften. Drain and rinse the cashews before using.